Home ⎢I Just Had It Serviced! I Just Had It Serviced! Andrew rolled off the tender boat into the exciting, fish-filled, current-strewn waters of northwest Papua, in the area known to divers as Raja Ampat. It was the first dive of a trip that he had been looking forward to for months. He deflated his BCD and descended. As he was rolling around onto his front to get his bearings, his world exploded. Suddenly, he had no regulator in his mouth and he was surrounded by a thousand Jacuzzis-worth of bubbles. As he was only at a depth of 6m or so, he decided to ascend to the surface first and then see what had happened. So, exhaling continuously, he rose up, emerging to the sunlight surrounded by the chaos of a frothing ocean. He made himself buoyant, then inspected the damage. Reaching for his regulator hose, which was whipping around him like an angry snake, he found that his second stage was completely gone and air was pouring out of the open hose-end. That was the source of all the bubbles then! He reached behind his head and turned his valve off, then swam to the tender boat, where the driver was looking understandably concerned. As he started to swim, Andrew realised that he had also somehow managed to lose a fin. For him, his first dive in Raja Ampat was done. Fortunately, he was fine, just a little shocked, and there would be plenty more dives on the trip, albeit none so dramatic. When I was running deep technical diving courses a few years ago, I was amazed at the number of times the students, visiting from all over the world, would encounter regulator problems in the confined water sessions or on the first ocean dive. These were genuine problems, not tests that I was engineering just to challenge the students. We were each diving with four independent regulators so there was evidently more that could go wrong compared with single cylinder recreational diving but the frequency with which problems occurred seemed to be well beyond statistical probability. Eventually, I connected the phenomenon with the fact that many of my students had had their regulators serviced before the course, not because the regulators were not performing properly but because the students were about to embark on an extreme diving course and wanted to make sure that their life support equipment was in the best possible shape. What they were doing was taking equipment that was functioning perfectly and getting someone to dismantle it and put it back together again unnecessarily, in contravention of the old adage, “If it ain’t broke, don’t fix it!” In the end, it got to the point where I had to ask candidates for technical diving classes specifically NOT to have their regulators maintained before the course if they had no substantive reason to think they were not working just fine. We had far fewer issues after that. Why should this be the case? Invariably, human factors are the key. It is the rare and fortunate dive centre that has a skilled, professional engineer on staff. Most regulator technicians are just divers who have completed a regulator maintenance course or have been taught by someone else who completed a regulator maintenance course. They might have a checklist and schematic to work from but they are not trained in technical processes. For instance, a common error that many dive centres make is failing to rotate their O-ring and service kit storage bins, adding new stock on top of old so that the old stock can become very old indeed by the time it is used. Not all dive operations have regulator test benches and testing a newly serviced regulator can amount to not much more than connecting it to a cylinder, breathing from it a few times and dipping it into a tank of water to see if it leaks. Neither is any dive centre set up to service ALL equipment brands. Although regulators function according to the same basic principles, they can be very different in form. Many have proprietary parts and some even require dedicated tool kits. We do not all share the same attitudes towards guarantees, insurance and maintenance schedules, so whatever I recommend, you will probably end up acting according to your natural inclination towards such things anyway. Which means, if you are the sort of person who strictly adheres to the service schedule for your car, then do the same with your regulator and follow the manufacturer’s guidelines. If, on the other hand, you usually wait until you detect a minor problem with your vehicle before taking it in, then adopt the same approach with your scuba gear too. If your regulator is looking mouldy, starting to leak or becoming difficult to breathe from, then have it serviced before things get worse. The important thing is not to wait until it fails completely before you take action. Where do you take it? There is a good chance that a dive centre that sells, uses and rents out a particular brand of regulators will also have qualified technicians on staff. Look for manufacturers course attendance certificates on the wall. Check the course dates to make sure that the staff have kept in touch with new models and check the names too, to make sure that they reflect the folk who are working on the equipment today, not staff members who are long gone. If in doubt, find an alternative. Use social media to ask other divers with the same brand of regulator for a recommendation. 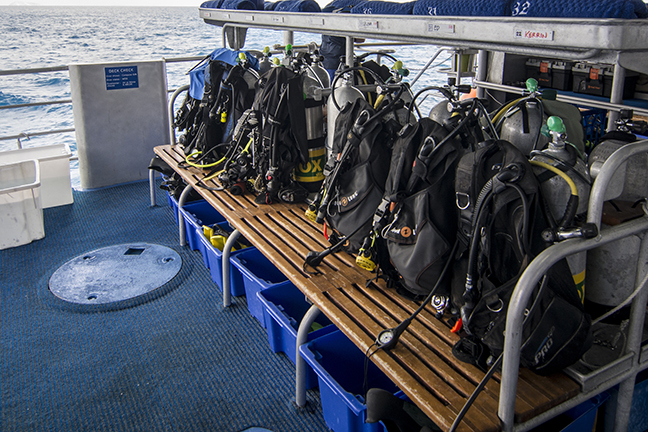 In countries where diving is well-established, you can find very well-equipped operations that actually specialise in fixing regulators and dive equipment in general. Some dive centres and resorts actually outsource their own repair work to these specialists too. Simon Pridmore has been part of the scuba diving scene in Asia, Europe and the United States (well, Guam) for the past 20 years or so. He is the bestselling author of Scuba Confidential: An Insider’s Guide to Becoming a Better Diver and has just published a new book entitled Scuba Professional: Insights into Scuba Diver Training and Operations. Both are available from Amazon in a variety of formats.